Google+ has been around for over five months now. The social network has grown well past the expectations of many users. This makes it even more of a surprise that Google+ is still not available to everyone yet. Individuals under 18 still are barred from having a Google+ account. However, businesses are beginning to see the value in Google+ with the site’s new Pages feature. Now, businesses wanting to set themselves apart from users can have public profiles for users to follow. If you’re a business or brand interested in making a Google+, read on to find out how. Step #1: What Category Are You? To create a Google+ page, you must be eligible to have a Google+ profile. While you don’t have to create one, you still must have a Google account and be over 18 years old. If you’re okay on both of those steps, then point your browser to the “create a page” website. Once there, you’ll be asked to pick a category to begin. You are offered four different choices including the “Other” choice. Local businesses are good for smaller, less well-known businesses. Product or brand would work for companies and larger known businesses. Company, institution, or organization is mainly for businesses that don’t directly sell something, mostly not-for-profits. Individuals in the entertainment field will fit right in the Arts, Entertainment, and Sports category. Not any of the above, click “Other”. Continue on with any other information asked of you, then click “Create”. 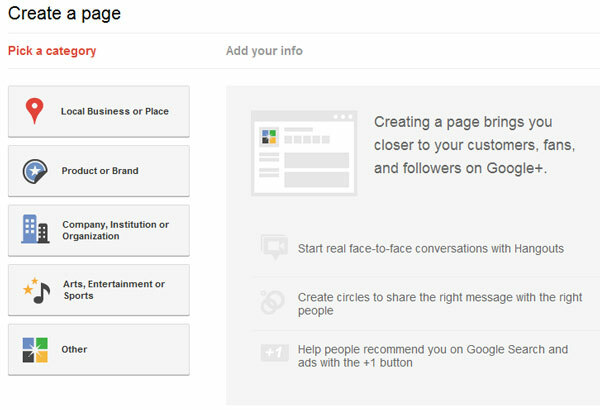 When building your Google+ page, you’ll be able to add many different aspects that will personalize your page. First, you can add a photo/logo and tagline. You can continue with an introduction, information, and contact info. When complete, add a photo strip of five different photos and click to finish. That’s it, you have your Google+ page for your brand/business/product finished. Now, it’s off to growing your Google+ base. Similar to average Google+ users, businesses can follow back fans and interact with them. This is a nice feature, but one that some individuals can be quite confused about. The object of this feature is to interact with individuals on different levels. For example, almost everyone involved/interested in technology is on Google+. For this reason, if you are a business with other members, follow them in a special group. This is the perfect opportunity to pass on important information with them. If you have individuals that follow you that you are interested about, follow them back as well. You, like all Google+ users, can have personalized circles. Use personalized circles to your advantage. When creating and using your business’ Google+, keep in mind that this is one extra aspect of your company’s public image. For this reason, make sure that your profile is easily discoverable. When created, share with your other social networking websites so that the audience will move with you. This can also be accomplished by using your full name in your profile. Google+ also has very easy to use code system, allowing you to link your blog/website with your Google+. With the steps above and tips outlined here, your Google+ page will grow your audience in no time. Great tips, with many social network pages we can promote more visitors to our blog and important to use page in order to grow.thanks. Yeah right. I created the Google Plus Page last month and it has about 50 followers now without any effects. The network could be more active like we think. Btw, did you ask me about the related posts plugin earlier? yeah, i wonder it betters off to ask your personally,… actually, I wanted to have related articles including social network shaing at the same as your. but I have only… when you visit my site, thanks.Hope you can helps me out! Actually they are options of the WooThemes that I am using. I don’t know if there is any plugin to create the related posts and social buttons. If you can’t find anyone, you can give WooThemes a try. I think small businesses that want to get adequate social media exposure, must make an effort to get a Google Plus Page. This is more evident now as Google’s social media platform is highly integrated with its other famous products.